Waves of continuous golden blooms right into the autumn. Polyantha Roses are AMAZING quality and SUPERB value for money, producing continuous waves of vibrant flowers - filling your garden with colour from June to November. 'The Fairy Yellow' produces masses of double, yellow blooms which blush apricot-pink as they age - contrasting with glossy green leaves - perfect for flower borders or patio pots. Colour: Yellow. Fragrance: 0/10 Height: 60cm Width: 100cm Flowers: Jun - Nov.
Making a welcome return to UK gardens, 'The Fairy' is a variety of Polyantha rose, a small, vigorous rambler with a low-growing habit which is invaluable as groundcover and perfect for filling patio pots with colour. As well as their gorgeous looks, 'The Fairy' series of polyantha roses are also extremely hardy with good disease resistance, forming neat, compact bushes which makes them ideal for growing in patio pots and the front of flower borders. Awarded the much sought-after RHS Award of Garden Merit, you can be sure that these plants have been assessed and declared perfect garden plants. Rosa 'The Fairy Yellow' has a cheery yellow flower which blushes apricot-pink as they age. Forming a well-branched plant with typical glossy, dark green leaves, Fairy Yellow is undemanding and flowers well into the autumn. 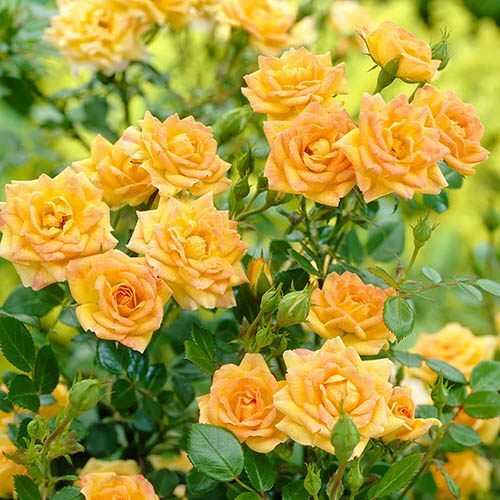 Grow in fertile, moist, well-drained soil in full sun or partial shade.Roses can be planted at any time of the year, as long as the soil is not frozen, waterlogged or drought-dry. In late winter or early spring, prune hard (back to 10 -18 inches) and reduce side shoots to 2 or 3 buds.